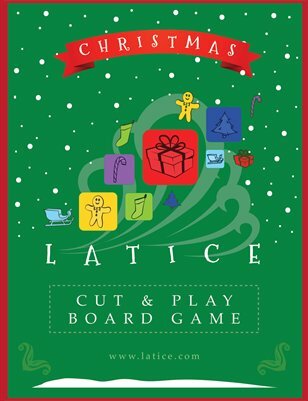 Christmas Latice Cut & Play Board Game comes with a card-stock game board, instructions, tile racks, tokens, and tiles. Most of the tiles contain one of six images (e.g., stocking, tree, gift) in one of six colors. There are also a number of special wind tiles. The game is for 2-4 players, who will evenly split the tiles. You win by being the first player to play all of your tiles.